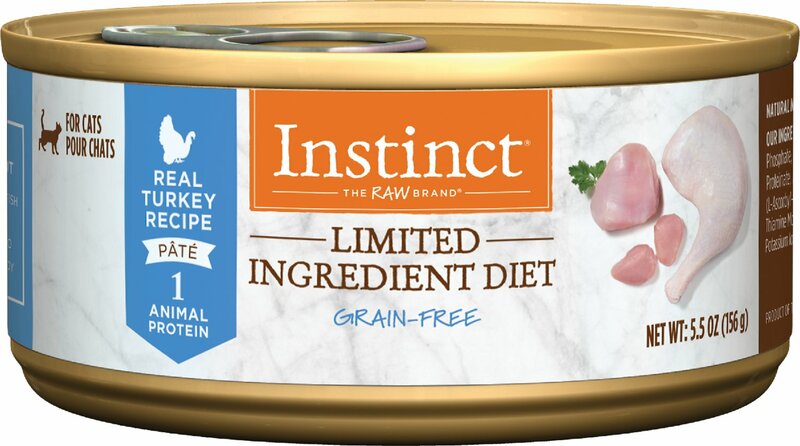 Satisfy your feline friend’s need for real food with Instinct by Nature's Variety Limited Ingredient Diet Grain-Free Real Turkey Recipe Natural Wet Canned Cat Food. Made with a purposefully simple list of ingredients, this savory pate contains just one animal protein and one vegetable, rather than the mix of each you’ll find in most other cat foods. Guided by the purity and simplicity of raw, it’s simple and essential nutrition your cat needs to thrive. Now she can enjoy a great-tasting, nutritious diet that’s easy on her digestive system and nourishing to her whole health. 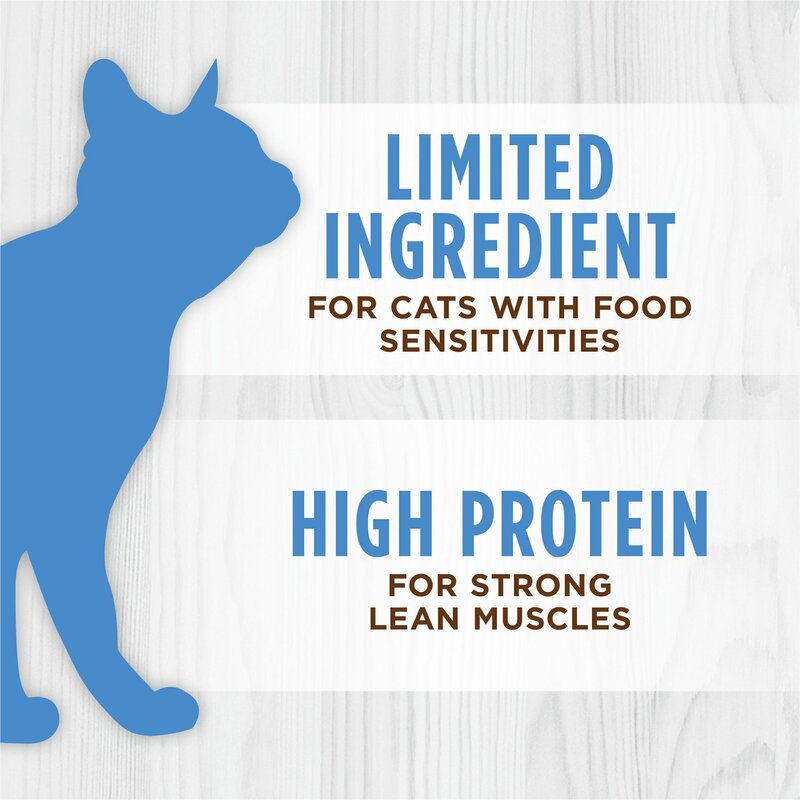 Features a purposefully simple ingredient list for cats with food sensitivities–just one animal protein and one vegetable. Cage-free turkey is the first ingredient, an easily-digestible, flavorful protein that provides all the essential amino acids she needs. Delicious pate is formulated with vitamins and minerals to deliver complete and balanced nutrition. Made without the use of chicken, beef, fish, dairy, eggs, grain, potato, corn, wheat or soy. Sometimes what's not included is just as important as what is. Our recipes are made with cage-free poultry or farm-raised rabbit and always made without grain, dairy, eggs, potato, corn, wheat, soy or artificial ingredients. 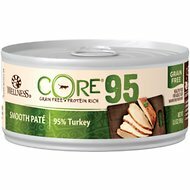 I did some research online for better food for my cats. Their poop smelled horrid, was inconsistent, and they just seemed to go to the bathroom constantly. I read up on Instinct and decided to give it a try. Not only do I no longer smell their poop at all....my automatic litter box has to be changed WAY less frequently. KUDOS to this brand so far!!! I have a Siamese with a sensitive belly and is on prescription food. He eats it fine but still vomits so I don't think it's working as well as the vet has hoped. He also refuses to the same food the next meal (can't say I blame him). So, I started to give him 1/4 of a can of this mixed with his prescription food and probiotics and he seems to like it much better and he doesn't vomit as much. When we received our kitty (age 13), his carpals were weak(couldn't even walk), his fur was all greasy and unkempt, overweight, diabetic, the whole runaround. My vet recommended this brand of food to me, and I am so grateful that she did. When we got his fructosamine test results back, his sugar was completely normal after only a few weeks of being put on this food! Not only that, from that point (October) to now, he can walk normal, he can walk fast, he can even jump!!! His fur is super soft, his weight is stable, I swear this is miracle food. Thank you so much Instinct! My older cat is pre diabetic so I'm in the process of changing to a more healthy wet food from Fancy Feast. This particular brand is just so so. I have two cats and they will eat it, but always leaves more in the dish. I will continue to serve them until it's all gone, who knows they may get used to it and like it. Time will tell. I did research on this food and it is a very good food. Has a lot of protein, and good ingredients. 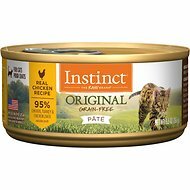 Unfortunately i can not get my cats to eat pate cat food. So back to something with gravy. I would recommmend this food for someones cats that eat pate. Cats seem to like this food. I like that it's carrageenan free and a limited ingredient diet. It's very pricey, wish they lowered the price a smidge. My cat used to love this cat food. Now he eats half of the meal and walks away. But have to admit that ingredients are good for decent priced cat food. **I don't know if it's the inventory problem or something else, but sometimes the color of food is different depending on the size of cans. They all like chicken or turkey. Glad Chewy has gotten Wild Calling back in. At least they will all eat that and I don't feel like I am wasting money even though it is expensive. Added those to my auto delivery.